The McCoy pottery products changed as the Head Designer changed. During the early period the look of the leaves and berries was the work of the designer Walter Bauer. Mr. Bauer's designs were always the same theme with the berries and leaves and the leaves and the berries the only variance was the shape or function of the piece. Mr. Cope shaped the future of the art pottery style that the Nelson McCoy Pottery is best known. Such familiar pieces as the series of planters produced: The Hunting Dog, The Wishing Well, the Village Blacksmith, Down by the Old Mill Stream. While these were functional pieces they were also works of art too. By todays standards the production techniques were quite crude. The process of mixing the clay, pouring the molds, and firing the pieces were manual and labor intensive. 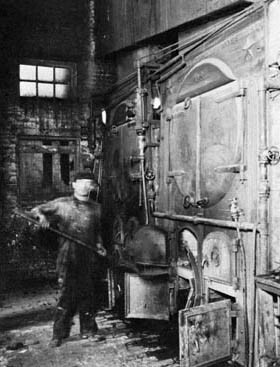 The kilns were all coal fired and extremely dangerous, with fire a constant worry. The potteries of the area suffered many set backs due to fire including the Nelson McCoy Company. A lot of changes went on in the 30's at the company, including the change in the name of the company to better suit the times. The new company, "The Nelson McCoy Pottery Company", shed the old image of the producer of crocks and jugs and ushered in the new techniques, designs and products that predominated through the 1940's. New circular kilns that were 50 feet in diameter provided a more efficient stacking and firing process. They were able to handle up to 5,000 pieces of artware in each and it only took 24 hours to process. 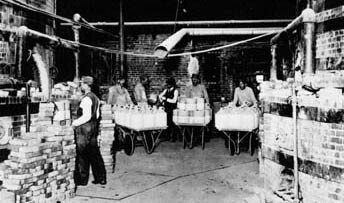 The old labor intensive techniques were replaced with new technologies to improve the quality and yield during the mixing, molding, and firing process. As the Company moved into the 40's so did the nation move into the war. 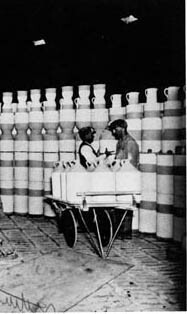 World War II proved to be yet another change in the operation and the products that the Nelson McCoy Pottery Company would produce. The Nation's War effort was moving industry into manufacture of War materials. And since land mines were made of clay rather than metal so they would not be detectable with metal detectors, the McCoy company was given a contract to full fill for the U.S. and its allies. This meant that the pottery had an allotment of clay to use for the manufacture of the mines and what ever was left over they could use to make their own products. They developed and produced a line of dinnerware and other related items. Once again they were functional items rather than decorative. Yet the items still had a degree of creative content. The country and the McCoy Pottery Company survived the war. McCoy continued to produce both functional and decorative art pottery. From the mid 40's and into the 50's and 60's the company produced a line of cookie jars, which today predominates in the interest of the collector of McCoy. Throughout its almost 100 years of existence the McCoy family maintained ownership of the company and the president of the company was a McCoy through 4 generations. The company continued to grow as the economy grew and was considered to be the premise manufacture of art pottery in the U.S. At the zenith of the company's existence the employment had grown to over 450, many of which were sons and daughters, sisters and brothers of the artisan who passed the trade on to their families. Even surviving a major fire in 1950, which destroyed the pottery, the plant was rebuilt and expanded several times and grew to over 200,000 sq. ft. and was able to produce on average a 50,000 pieces a day. In 1967 yet another change came to the McCoy Pottery. The company was sold to The Mount Clemens Pottery Company and again in 1974 was sold to The Lancaster Colony Corporation. While the pottery maintained its creativity it was facing ever increasing competition from "Off Shore" products that was making it difficult to make a profit and continue to grow. The quality of the product was excellent in comparison, but the public was looking at a less expensive alternative to the U.S. made product. In 1990 the McCoy Pottery ceased operation after a number of declining years of sales and profit. While it is sad that a Century of existence ended for the company, it lives on through the many collectors and individuals that appreciate the art form known as "Art Pottery".